INTERNATIONAL CONTEST OF COMPOSITION ‘STUDIES FOR PRACTICAL PLAYERS` DEVOTED TO MARK DVORETSKY`S 60TH ANNYVERSARY. Mark Dvoretsky and Oleg Pervakov are the judges of the contest. 1st prize - $500, 2nd prize - $300, 3rd prize - $200, 4th prize - $100, 5th prize - $50. Special awards – $350 total. Other prizes are Mark Dvoretsky`s books in three languages – Russian, English and German. The results of the contest will be concluded on December 1,2007. My collection of exercises, which I often use for training young players and quote in various books and articles, includes more than a thousand selected studies. I would like to tell you about my criterions of selecting studies. It is a system of preference of practical chessplayer and trainer. As a matter of fact, my preferences are very personal and they can differ from the tastes of other chessplayers, trainers and professional composition experts. However, it is necessary to tell about my favors because I invite chess composers to take part in the contest ‘Studies for practical players`. Oleg Pervakov, an excellent composition expert, and I will be the judges of this contest. Of course, Pervakov won`t allow us to miss an outstanding masterpiece that will not be in keeping line with this article. However, I think that my preferences will influence the results of the contest as well. Every chessplayer gets pleasure from short studies with bright and unusual idea. There are some examples. The first move is obvious. 1.f8Ј! ¦xf8 2.gh+ўf7. Now instead of predictable continuation 3.¦xf8+ ўxf8 4.¦f1+ ўg8 5.h6 (after 5.ўe7 h6 the endgame is drawn) 5...gxh6 6.ўe7 that allows Black escaping after 6...h5! 7.¦g1+ ўh8 8.ўf7 h6, White makes an incredible quiet move that turns out to be very strong. 3.¦h8!! ¦xh8, and now White plays 4.¦f1+ўg8 5.h6! gh 6.ўe7 with unavoidable checkmate. White can`t achieve the victory by ‘normal` moves. Black has time to attack the a-pawn with his rook and king. For example, 1.Ґc8 ўd3 2.Ґb7 ¦a1 3.¤f4+ ўc4, or 1.Ґd7 ¦a1 2.Ґb5+ ўf3 3.¤h4+ ўe4, or 1.¤h4 ¦a1 2.Ґc8 ўd3 3.¤f5 ўc4. The only way to win consists in unexpected knight sacrifice. 1.¤f4+!! ¦xf4 2.Ґd7! The paradoxicality of this situation is indeed impressive! 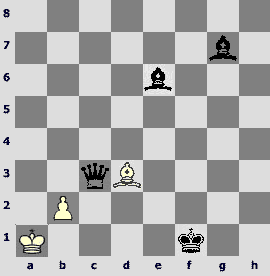 The Black`s rook has two tempos to move either to the a-file or to the 8th rank. However, both ways are blocked (2...¦f3 3.Ґg4; 2...¦f1 3.Ґb5+; 3...¦f6 3.a7 ¦a6 4.Ґb5+)! Such studies are very useful for chessplayers because they develop the most important habit. I am talking about the skill of keeping an eye on the opponent`s intentions attentively. It seems that it is quite easy to stop the pawns. It looks like White can do it in different ways. For example, 1.ўc4 b3 2.¤d5 b2 3.¤c3. 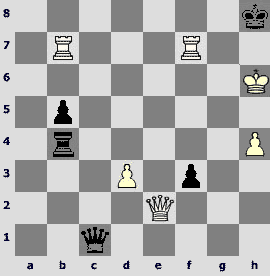 But White meets an unpleasant surprise in this variation: 3...b1Ј!! 4.¤xb1+ ўa4 and the bishop's retreat leads to a stalemate. The other attempt is 1.¤e4 b3 2.¤c3, and in the case of 2...b2? White defeats the opponent by 3.ўe4! However, Black can save himself by 2...ўb2! followed by 3...ўc2. White can neutralize all traps of the opponent if he finds the only order of moves: 1.ўe4!! b3 2.¤d5 b2 (2...ўb2 3.ўd3!) 3.¤c3 ўb3 4.ўd3. I am not sure that such studies can win the modern contest of composition but they would certainly get one of special prizes in our competition. Many studies were conductive to the development of the endgame theory. Now it is almost impossible to talk advancing any kind of the endgame theory that can be useful for practical players. For example, there are situations with two pieces vs. a rook and a piece or against three pieces. Analyzing this kind of positions seems useless because it they rarely occur in practical games. I have never played such positions myself. Moreover, if such material ratio occurs in the game once or twice, it is not a reason to learn complicated details of handling such situations. I doubt whether it can help the player. That`s why studies without pawns or studies that are based on different details of Troitsky`s positions (two knights against a pawn) don`t attract me indeed. Composition experts still can show young players some important aspects of modern endgame theory and help them understand it better. A purpose of the study is often achieved with the help of paradoxical continuations. An unusual exception of the well-known rule is the main idea. To my mind, the following study is one of the brightest studies of the latest years. 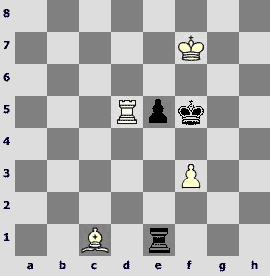 The first moves are as obvious as they are in Votava`s study. 1.h7 ¦a2+ 2.ўb3 ¦h2 3.ўxa4 ўg2! Composition experts like extending the play. I often leave out such introduction in my exercises and offer the critical position immediately. Let me remind that the famous study of Sarychev brothers (White: ¢d7, §с7; Black: ¢f3, ¥h7, §b7 1.ўc8!!) also had opening moves, but the fact is that nobody knows about it now. I have already expressed my opinion about van der Heiden`s study in the article "Paradox" on the website ChessCafe.com. Now I would like to repeat my account with little changes. The first move is clear – 4.ўb5. It is easy to make sure that after 4...¦xh7? 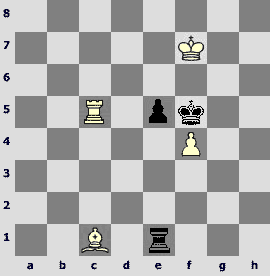 5.a4 White achieves a draw without difficulties. But the point is that Black has other opportunity that is more dangerous indeed – the Black`s king marches immediately to the queenside. 4...ўf3 5.a4 ўe4 6.a5 ўd5 and 7.a6 loses because of 7...¦b2+! 8.ўa5 (8.ўa4 ўc4!) 8...ўc5! 9.ўa4 ¦h2 (or 9...¦b8) 10.a7 ўb6! In case of 7.ўb6 Black wins by 7...ўc4! ("outflanking" is an important endgame tool!) 8.a6 ¦h6+ 9.ўa5 ¦xh7 10.ўb6 ¦h6+ 11.ўb7 (11.ўa5 ўc5) 11...ўb5 12.a7 ¦h7+ 13.ўb8 ўb6 14.a8¤+ ўc6. How can we improve the White`s play? It is necessary to use a well-known method of the endgame – "shouldering". Play 6.ўc5!? instead of 6.a5 so that the Black`s king doesn`t have the d5-square. This continuation looks tempting but unfortunately Black manages to refute it by 6...¦h5+! 7.ўb6 ўd5 8.a5 ўc4! (outflanking again) 9.a6 ¦h6+. We have already seen this position. 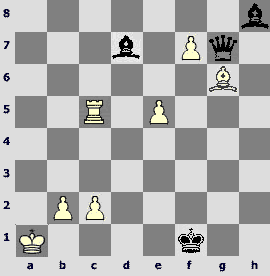 The following variation doesn`t help White: 6.ўc6 ўd4 7.a5 ўc4 8.a6 ¦h6+ 9.ўb7 ўb5. Well, it means that the starting position is lost and White doesn`t have any chances to save this game. We have looked through all continuations, haven`t we? To tell the truth, we looked through all natural opportunities. We acted according to the regular rules of such positions. 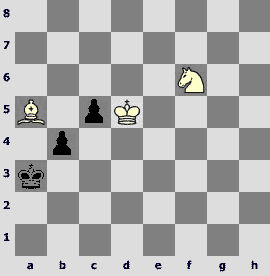 White moves his king forward as quickly as it is possible and shoulders the enemy king. However, it turns out that it is necessary to abandon both these rules. A key to the study is the fact a position of reciprocal zugzwang arises with the kings on b5 and d5, White`s pawn on a5 and Black`s rook on h2. 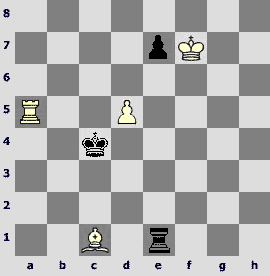 White has to lose a tempo in order not to get into trouble. We know that White loses if he is to play in this position – 8.a6 ¦b2+! or 8.ўb6 ўc4! However, it is Black`s turn now, and it is difficult to give him a good advice. As now the a6-square is free, Black can`t achieve anything after 7...¦b2+ 8.ўa6 ¦b8 9.ўa7 ¦h8 10.ўb6! (now it is really necessary to shoulder again) 10...ўd6 11.a6 ¦b8+ 12.ўa7 ўc7 13.h8Ј¦xh8 – stalemate! It is the main variation of this study. If 7...ўd6, then 8.ўb6 (now it is impossible to outflank via c4) 8...ўd7 9.ўb7 ўd8 10.a6 ¦xh7+ 11.ўb8! ¦h1 12.a7 ¦b1+ 13.ўa8. It is strange that Black doesn`t have a waiting rook move. In case of 7...¦h1 8.a6 ¦b1+ 9.ўa5 it is impossible to play 9...ўc5?? 10.h8Ј, and the a1-square is controlled. The shortcoming of 7...¦h3 can be seen from the following variation – 8.a6 ¦b3+ 9.ўa4! (Black can`t reply 9...ўc4) 9...¦b8 10.a7 ¦a8 11.ўb5 ўd6 12.ўb6 ¦h8 13.ўb7. At last, 7...¦xh7 leads to a drawn position that occurred many times in practice: 8.a6 ўd6 9.ўb6 ¦h1 10.ўb7! (after 10.a7? ¦b1+ 11.ўa6 ўc7 12.a8¤+ ўc6 13.ўa7 ¦b2 White loses his knight) 10...¦b1+ 11.ўc8! (shouldering) 11...¦a1 12.ўb7 ўd7 13.a7 ¦b1+ 14.ўa8! The paradoxicality of this position doesn`t consist in the fact that it is necessary to lose a tempo in order to avoid the zugzwang and put the opponent in zugzwang himself. Such situation is not rare in the theory of endgames. What is really impressive is that the zugzwang occurred in a position with such material ratio! I don`t know any other examples. That`s why it seems to be unique. There is always only one question in the struggle of a rook against a pawn: who will be the first?Well, this study is one more example: never say never! There are no absolute rules in chess. Van der Heiden`s study not only extends the chessplayers` knowledge but also helps them to remember some standard ways of playing rook vs. pawns endings. Now it is necessary to touch on a delicate problem. I am sure that the unique endgame position was found with the help of Thompson`s database. Does this fact detract from the merit of the study`s creator? Now the database is available to everyone. To my mind, it is possible to create many interesting studies using the database. A lot of chess composers take out different studies from the database regularly. But wonders based on computer analysis without containing a bright hidden idea are interesting only for some esoteric aesthetes. I am sure that if van der Heiden`s position occurred in the practical game, even the world champion wouldn`t have found the solution. He wouldn`t hesitate at all. I guess he would automatically played 4.ўb5? At the same time, even a mediocre player can understand this clear and logical solution. Of course, the fantastic 1.¤a1!! is a real brilliant of this study. White moves his piece to the corner instead of leading the king or the knight to the central pawns. I stated the chain of arguments that can help finding the solution in my Endgame Manual. 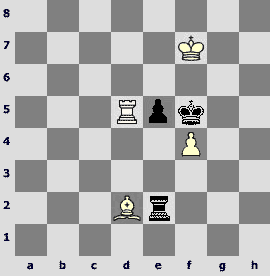 At first, let`s first examine White`s most natural plan: approaching the pawns with his king. 1.ўс1? ўg4 2.ўd2 f3 3.¤e3+ (3.ўе3 f2! 4.ўxf2 ўf4) 3...ўf4 4.ўd3 f2 5.¤f1 ўf3 6.¤d2+ ўf4! We have reached the reciprocal zugzwang position fundamental to this endgame. Black to move loses (7...ўg3 8.ўе2). But it`s White`s move here, and 7.ўе2 is met by 7...f1Ј+! 8.ўxf1 ўе3 9.ўе1 ўd3 10.ўd1 ўе3 11.ўc2 ўd4, draw. Let`s try 1.¤а3? f3 2.¤с4. Now the natural 2...ўg4? leads to a loss: 3.ўс2 ўg3 4.ўс3! (zugzwang) 4...ўg4 (4...f2 5.¤d2 ўf4 6.ўd3; 4...ўf4 5.ўd3 f2 6.¤d2) 5.¤xe5+! ўf4 6.ўd4. White won here only because with his king at c3 the e5-pawn could be captured with check. That can be avoided by playing 2...ўg5(h4)!! 3.ўс2 ўg4! 4.ўс3!? ўg3! (there is also 4...ўg5! ?, for example, 5.ўd2!? f2 6.¤е3 ўf4 7.ўd3 ўg3! 8.¤fl+ ўf3! 9.¤d2+ ўf4). We have reached another reciprocal zugzwang position, this time with White to move. 5.¤d2 runs into 5...ўf4 6.ўd3 f2= (the main zugzwang); and equivalent line is 5.ўd2 f2 6.ўе2 ўf4 7.¤d2 (7.¤d6 ўg3) 7...flЈ+! or 5.ўd3 f2 6.¤d2 ўf4! Incidentally, looking at this variation leads us to the astonishing conclusion that both sides should maneuver so as not to be first to approach the other. As soon as White plays either ¤d2 or ўd3, he falls into zugzwang; and if Black is too hasty with either f2 or ўf4, the zugzwang position occurs with him to move instead. Thus we have a case known from pawn endings: mined squares. However, this is the only case I know of where the squares are mined for four different pieces at once, and not for the usual two. That`s why Blundell`s study seems to be unique. And now, for the solution. White must play much as in the last variation, except that he must place his knight not on c4, but on b3, leaving the c4-square open for his king. 1.¤a1!! f3 2.¤b3 ўg4 3.ўс2 ўg3 4.ўc3! ўg4 5.ўс4! Here`s the point! 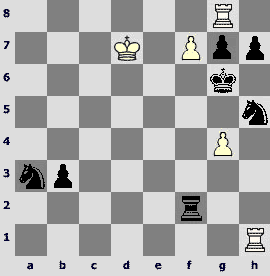 Black can wait no longer: on 5...ўg3 White wins by 6.ўd5 f2 7.¤d2 ўf4 8.¤f1. Black must go to the mined square first, which of course puts him into zugzwang. Blundell`s study is rather difficult. However, it is not insoluble, and the study`s difficulty does not turn into analytical research. Nevertheless, if there were no brilliant introduction to this study, it would have been just a usual analytical study and wouldn`t have impressed us so much. The difficulty of the previous examples consisted in the fact that it was necessary to find an unusual and disguised idea. There is another kind of studies that is also very important for practical players. It is a question of choosing of the only correct move among several tempting continuations. Let me notice that solving this problem is enjoyable because it looks so natural. White`s king is in the lower part of the board and Black`s king is in the upper one. The structure of the pawns and the material ratio are quite usual. White attacked on the kingside and sacrificed an exchange. Now he has to demonstrate the merits of the attack. After 1.Ґc2? ўxh6 2.fxg6 ўg7 3.Јc3+ ¦f6 Black blocks the opponent`s pawns and White`s king has no chances to force his way to the enemy king. The game is even. The following continuation looks tempting - 1.fxg6+ Јxg6 (Black loses after 1...ўxh6 2.Јh4+) 2.Ґc2! Black has a counterblow 2...¦xf4+!, but it is not necessary to take a rook. If it is the only promising way, a practical player will play so without paying attention to calculating the variations. Let me repeat: there is no sense in solving problems that will not happen in practical games. However, it is necessary to look at this position attentively before making a move. It is very important not to miss something substantial. The principle of candidate moves is one of the most important principles in calculating the variations. There is an interesting tactical continuation 1.Ґa4. The bishop is invulnerable but there is a defense: 1...b5, and 2.Ґxb5?? is impossible because Black takes the bishop with check. However, if White`s bishop returns to c2, or White plays 2.fxg6+, we`ll get to the known positions but with the Black`s pawn being on b5. It is unclear whether it is important, because the main events are on the opposite side of the board. Nevertheless, there is a choice. So one has to start calculating. It is also necessary to take into consideration that Black`s pawn can stand either on b6 or on b5, according to our wish. 1.Ґa4!! b5! 2.fg+!Јxg6! 2...ўxh6? 3.Јh4+ ўg7 4.Јh7+ ўf6 5.g7 ¦g8 6.Ґc2 ¦xg7 7.Јf5#. There is also more a difficult variation: 2...ўg8 3.g7! ¦xf4+ 4.Јxf4 bxa4. It seems that the location of the b5-pawn helped Black, but we shouldn`t turn down 1.Ґa4 because White still manages to win: 5.Јf5! a3 6.h7+ ўxg7 7.Јf7+ Јxf7+ 8.exf7. 3.Ґc2! ¦xf4+! 4.ўg1! It is the only way of playing for a win (4.ўg2?? Јxc2+; 4.ўe1? ¦e4+; 4.Јxf4? Јxc2 5.Јf7+ ўxh6). 4...¦f6! 5.Јg5! 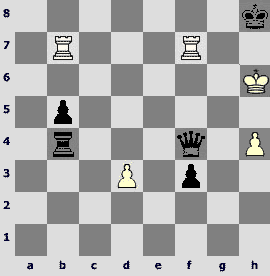 White repels the opponent`s threat 5...ўxh6. If 5...ўh8, then 6.Јxg6! 5...¦xe6! 6.ўf1! It is time to remove the king from the g-file, otherwise the Black`s rook starts attacking the bishop from the 6th rank forever. Now the only way to defend against 7.Ґxg6+ consists in chasing the king. 6...¦f6+ 7.ўe1 ¦e6+ 8.ўd1 (8.ўd2? ¦e2+!) 8...¦d6+ 9.ўc1!¦c6! 10.Јc5!! That`s why it was necessary to force b6-b5 – White provided the c5-square for his queen!After 10...ўxh6 11.Ґxg6 ¦xc5+ 12.bc ўxg6 13.c6 the pawn queens. This calculation is not easy but it is quite doable because there aren`t many sideline variations. How should a trainer use studies, which cannot be calculated to the end? Insisting on conducting this kind of calculation, the trainer eventually forms an irrational algorithm of decision-making, and the student will suffer from time troubles, dropping important points. Such studies must be not calculated by played through, move by move, solving new problems on every move. It is great if trainer or friend who knows the solution opposes the student. I used such method of training regularly and I made sure that it is really effective as it creates situations similar to real tournament struggle. Let me show you a few studies suitable for playing. Vitality of the initial position pleases our eyes. White claims the advantage and pins his hopes with the passed c6-pawn. However, neither 1.c7 ¦c8 2.¦d8+ ўe7 nor 1.Ґxc4 Ґxc4 2.c7 ¦e8 3.f5 (3.¦d8 Ґe6) 3...a5!? helps White achieving success. There is only one promising way of playing for a win. 1.f5! gxf5 2.Ґh3. Now taking on e4 is impossible due to the bishop exchange followed by c6-c7. There is no 2...¦c8 due to 3.exf5. Therefore, this continuation seems promising. To my mind, one should play it because there are no better moves. 2...¦e8. Black prepares retreating the bishop to c8. White achieves nothing after 3.c7? Ґc8 4.Ґxf5 ўe7! However, immediate capture on f5 keeps more dangerous opportunities in White`s possession. Here one should start thinking. Black has no problems after 4.c7? f6!, but there are also two interesting gambit moves: 4.f6!? and 4.¦d7!?. One cannot do without accurate calculation. We either have to refute one of them and make sure that the second one is promising (using a method of exclusion that has helped us choosing the first moves), or to guess the right continuation and count the variations to the victory. Smyslov didn`t analyze 4.¦d7 in his notes though it is very difficult to refute this move. 4...Ґxd7? is hopeless – 5.cxd7 ¦d8 6.f6 ўg8 7.Ґf5! 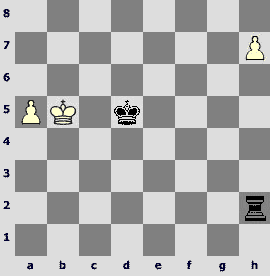 Black`s pieces are blocked on the 8th rank and White`s king advances without obstacles. If Black plays 4...ўg7?, White proceeds with 5.c7! ¦e1+ (5...Ґxd7 6.f6+ ўxf6 7.Ґxd7) 6.ўd2 ¦h1 7.Ґg4! (not 7.¦d8? 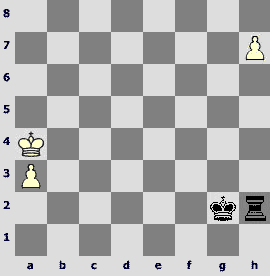 c3+ 8.ўc2 ¦h2+, and White`s king cannot advance to the 3rd rank. The following continuation leads to a draw 7.f6+? ўg6! 8.Ґg4 ¦h4 9.¦d8 Ґxg4 10.¦g8+ ўxf6 11.¦xg4 ¦h8=) 7...¦g1 (7...¦h4 8.¦d8) 8.f6+! (8.¦d8!? is also a strong move) 8...ўxf6 (8...ўg6 9.¦d8 Ґxg4 10.¦g8+ ўxf6 11.¦xg4) 9.¦xf7+ ўxf7 10.Ґxc8, and White wins. White also has an advantage after 4...f6?! 5.¦c7 a5 6.a4. Probably a chess composer would demand more accurate evaluation, but it is sufficient for a practical player to decide on making the move. The only continuation that provides Black with a draw is 4...¦e3! 5.¦c7 (5.f6? leads to nothing because of 5...ўe8!) 5...¦xh3 6.¦xc8+ ўe7. 4.f6!! Ґxh3 5.c7 a5. If Black chooses 5...Ґf5, then White plays 6.¦d8 c3 7.ўd1 (or 7.a4 a5 8.ўd1) 7...a5 8.a4! c2+ 9.ўc1! c4 10.ўd2, and Black suffers because of zugzwang. 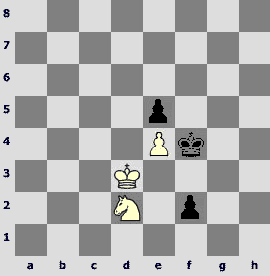 Creating this kind of zugzwang was the aim of sacrificing the bishop. However, one must try hard to make sure the opponent moves in the zugzwang position. 6.¦d8. It is necessary to pin down the activity of the opponent`s pieces: 6.ўb2? is a mistake because of 6…¦e2+ followed by 7...ўg8. 6.a4? 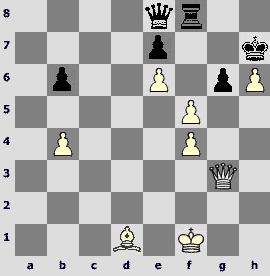 is also weak: 6...ўg8 7.¦d8 ¦f8 (or 7...ўf8) 8.ўc2 Ґg4 9.ўc3 Ґe6 – White is in zugzwang. 7...Ґe6 (7...Ґf5 8.ўc3 Ґe6 9.a3) 8.ўc2! Ґf5+ (8...a3 9.ўc3) 9.ўc3 Ґe6 10.a3. 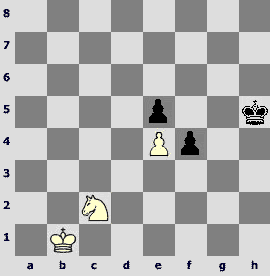 Black loses his pawns because of zugzwang, the White`s king penetrates, and wins. 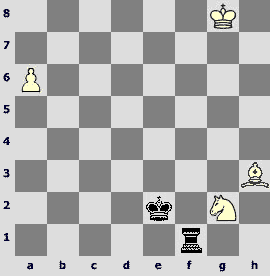 A normal-looking endgame; achieving material advantage is rather easy for White, but preserving it is quite difficult. He has to make an important choice on the very first move – either take the bishop or play 1.¦c5, threatening to win a piece by 2.d6+. Calculating the lines to the end is hardly possible, but we`ll probably manage dismissing one of the alternatives in the process of checking them up. Let`s start with capturing the bishop. 1.fxe4+ ўxe4 2.¦c5 (useless is 2.ўe6 ўd4+ 3.¦e3 ¦xc1) 2...ўd4 3.¦a5 ўc4 (of course, 3...¦xc1? is wrong because of 4.ўxe7). White can repel Black`s threat 4...¦e5 by either 4.Ґf4 or 4.Ґb2. However, both of these moves bring zero winning chances because the d5-pawn is lost in any case. Therefore, 1.fxe4+ leads to a drawn position. а) 4.Ґb2 ¦e2 5.Ґg7 ¦e1 6.Ґf6!? ¦e2! 7.Ґxe7 ¦e5. б) 4.Ґf4 ¦e4 5.Ґc7 ¦e1 6.Ґh2 ¦e2 7.Ґg1 ¦e5 8.¦c5+ ўb4 9.ўe8 ¦e1 10.Ґf2 ¦e2 11.¦c7 ¦e5. 1.¦c5!! Ґxd5+! The only defense against a lethal threat of 2.d6+. 3.Ґd2! Equally strong looking 3.¦c5? lets Black off the hook by 3...¦e3!! 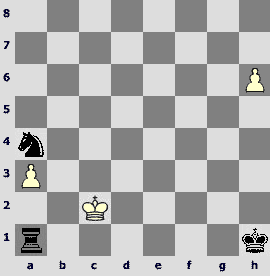 4.f4 (4.Ґxe3 is a stalemate) 4...¦e1, and White is in zugzwang. 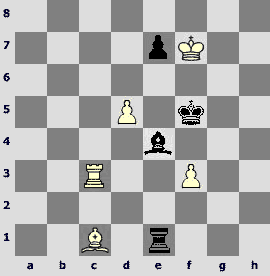 The position of reciprocal zugzwang that arises after 5.ўe7 ¦xc1! 6.¦xc1 ef 7.¦f1 ўe5! is known from Reti`s famous problem (1928). The Black`s king shoulders the enemy king and doesn`t let it approach the pawn: 8.ўf7 (8.ўd7 ўe4 9.ўe6 f3) ўf5! 9.ўg7 ўg5! After 5.Ґd2 ¦e2 neither 6.¦d5 ¦xd2! 7.¦xd2 ef 8.¦f2 (Black having the right to move is unimportant because the f2-rook stands too close to the king) 8...ўe4 9.ўg6 f3 10.ўg5 ўe3, nor 6.ўe7 ¦xd2 7.fe ¦a2! 8.e6+ ўg6 helps White. The position after 8...ўg6 is drawn because Black`s rook is on the long side of the board and is ready to start checking. The analysis of the variations was based on calculation and understanding of general endgame themes, so we have gotten some training in both. Let`s analyze another unsuccessful attempt – 3.Ґh6?. Black replies 3...¦a1!, andthe rook takes the long side. After 4.f4 ¦a7+ 5.ўe8 ¦a8+ 6.ўd7 ¦a7+ 7.ўd8 ¦a8+ 8.ўc7 the simplest is 8...ўg6 9.fe ўxh6, though 8...¦a7+ 9.ўb6 ¦e7 10.ўc5 ¦e8 is also playable. 5.Ґc1! With the king on f7 5.¦a5? ¦xd2 6.fxe5 does not work because of 6...¦d7+. 5...¦e1 6.¦c5. We saw this position in the 3.¦c5? line, but now it is Black to move, and he is in zugzwang. 6...¦e4. After 6...¦xc1 7.¦xc1 ef 8.¦f1 the Reti position with Black to move arises, and he loses the opposition: 8...ўe4 9.ўg6(f6) or 8...ўg4 9.ўe6(f6). 7.ўe7! ¦e1 8.Ґd2! Mistaken is 8.ўd6? ¦d1+ 9.ўc6 (9.ўe7 ¦xc1! 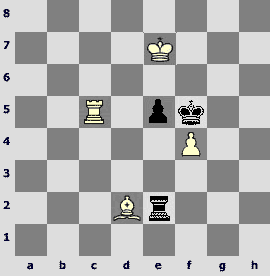 10.¦xc1 ef 11.¦f1 ўe5!, and White to move in the Reti reciprocal zugzwang position. 9...¦e1 10.Ґd2 (10.ўb5 ўe6) 10...¦e2 11.¦d5 ўe6! 9.¦a5!! Of course, 9.¦d5? ¦xd2!= is bad. 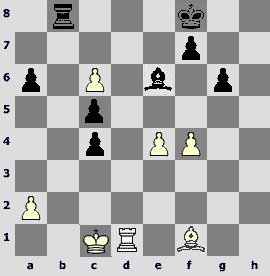 The rook seizes the a-file in order not to let its counterpart moving on the long side (9.¦b5? ¦xd2 10.fe ¦a2! 11.e6+ ўg6). 9...¦xd2. 9...¦e4 is also hopeless: 10.¦d5 ¦e2 11.ўd6. 10.fxe5 ¦b2 11.e6+. 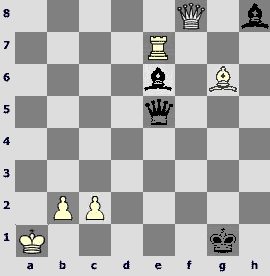 The Black`s rook is on the b-file, which is not far enough from the e-pawn. There must be at least three files between them for the flank attack to succeed. Therefore, White wins. Perhaps this study is rather difficult – three grandmasters played it against me, and each of them made mistakes on the first or on the third move. However, in spite of this fact, its aesthetic and training value give rise to no doubts. I especially appreciate the studies in which both opponents have to demonstrate remarkable resourcefulness and accuracy. It is possible to offer such studies for playing between two students. The players are almost equal, because White always achieves his purpose if plays absolutely right. However, when the players struggle for a long time, and both the opponents have to crack many different problems, then their chances are practically even. When I wrote this article I applied to van der Heiden`s base of studies and I found three versions of this study. Formerly I knew and used only one of them, which was a move shorter. I have already mentioned that sometimes it is sensible to leave out introductory moves that are not important for the whole study. The situation with studies for mutual playing is opposite. Probably, it is even useful for the student to calculate technical variations (but they shouldn`t be very difficult) – this allows disguising the critical moment, when he tactical melee starts. 1.¦c7! White loses after 1.¦d5? Ґe6, for example, 2.¦d8 Ґxf7 3.Ґxf7 Јxe5! or 2.¦d6 Ґxf7 3.¦f6+ Јxf6 4.exf6 Ґxg6. 1...Ґe6! 1...Јf8 does not promise anything real: 2.¦xd7 Ґxe5 3.¦d1+ ўf2 4.c3 or 3...ўe2 4.Ґh5+ ўe3 5.c3. Strong f7-pawn confines the opportunities of Black`s pieces and prevents him from exploiting his material advantage. This assessment is also true after 1...Јh6 2.¦xd7 Ґg7. White can play either 3.Ґd3+ or 3.¦d6 ўf2 4.Ґe4, threatening 5.¦f6+. 2.¦e7. White loses the e5-pawn after 2.c3? Јh6, and his position looks hopeless: 3.Ґb1 Ґxe5 4.¦e7 Ґg7. Now the Black`s bishop is under attack. A normal move 2...Ґd5 allows the opponent escaping by 3.¦e8! The point is that after 3...Ґxf7 4.Ґxf7 Јxf7 5.¦xh8 the White's rook will move to the 3rd rank (via of a8 or h3). White will construct an impregnable fortress (a rook and a pawn on the 2nd rank against a queen) that is known since the times of Philidor. 3...ўe2 changes little: 4.b3! (of course, not 4.f8Ј?? Јa7+) 4...Ґxf7 5.Ґxf7 Јxf7 6.¦xh8 Јg7 7.¦h3 Јxe5+ 8.ўb1. That`s why Black shifts from exploiting the material advantage to a direct attack against the king. 2...Јxe5! 3.f8Ј+ ўg1! The Black`s king is protected against any checks here. Black threatens to checkmate from either b2 or e1, so there is no choice. 4.c3 Јe1+ 5.Ґb1 Јxc3! The queen cannot be taken, and it seems that White has to resign.Now we can enjoy the series of excellent sacrifices. 6.¦g7+!! Ґxg7 7.Јf1+!! ўxf1 8.Ґd3+! Taking the bishop leads to a stalemate, and otherwise, White captures on c3. However, the exciting struggle is not over yet. 8...ўe1! 9.bcўd2. The bishop is attacked, and in addition, Black threatens with10...ўc1, with imminent checkmate. Now White must find one more move in order to survive. 10.Ґc2! ўc1! (10...ўxc2 - stalemate) 11.Ґb3! Taking the bishop again leads to a stalemate, and after 11...Ґxc3+ 12.ўa2 the position is drawn. 1.¦xf7. It is easy to find out that there are no better moves. After 1.Јe5? 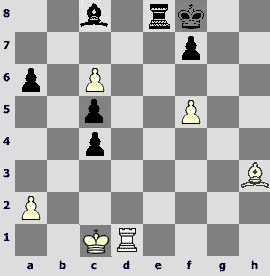 Black delivers the mate by 1...Јd1+ 2.ўg5 Јg1+ 3.ўxf6 Јg6#. A desperate 1.¦e8+? ўh7 2.¦h8+ ўxh8 3.Јe8+ is senseless because after 3...ўg7 4.¦xf7+ ¦xf7 5.Јe5+ ўh7 White immediately runs out of checks. After the text-move Black has to start looking for tactics. Well, we let him sacrifice and try finding a hole in his plan! 1...¦h6+! 2.ўxh6 f3+ 3.ўh5 Јh6+!! Sacrificing another rook fails to save Black: 3...¦xh4+? 4.ўxh4 Јh6+ 5.ўg4. But what is the point of the queen sacrifice (well, actually not the queen, but the c2-pawn)? The point is that after 5.ўh5? Black has a new checking direction: 5... Јc5+! 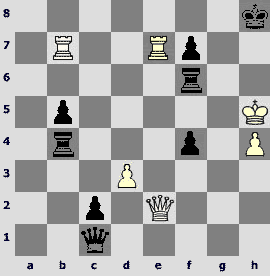 6.ўg6 ¦g4+ (this rook protects the Black`s king from the back rank mate) 7.ўf6 fxe2, and Black wins. The only defense consists in distracting the opponent`s queen from the c-file. 5.Јd2!! Јxd2+ 6.ўh5. Now Black can repeat this position three times by 6...¦xh4+ 7.ўxh4 Јh2+ 8.ўg4 Јg2+ 9.ўh4, but he can also try squeezing a win. 6...Јf4! Taking under control both b8 and f8 squares. It is obvious that the only way of continuing the game is connected with the capture on f4 followed by ўg6. But attention! The principle of candidate moves, discussed earlier in the article, helps us finding a new resource: sacrifice of the d4-pawn. The reason for this sacrifice is unclear, but we must not neglect this possibility in our calculations! 7.d4!! ¦xd4. 7...Јd6 is not dangerous for White: 8.¦bd7 Јxd7 9.¦xd7 ¦a4 (in order to check via the 6th rank after 10.ўg6) 10.¦f7. 8.¦xf4 ¦xf4 9.ўg6 ўg8. If Black protects his king by placing the rook on the g-file, White`s rook stops the f-pawn: 9...¦g4+ 10.ўh6! ¦xh4+ 11.ўg6 ¦g4+ 12.ўh6 f2 13.¦f7, and the position is drawn. 10.¦b8+ ¦f8 11.¦b7! White threatens with a threefold repetition, checking on g7 and h7. The only chance of avoiding it consists in sacrificing the rook. 11...¦f6+! 12.ўxf6 f2 13.ўg6! f1Ј 14.¦b8+ Јf8 15.¦xf8+ ўxf8 16.ўf5 b4 17.ўe4 b3 18.ўd3. That`s why White sacrificed a pawn on the seventh move – he vacated the d3-square for his king! Otherwise the b-pawn could not be stopped.